Natural killer (NK) cells are part of the innate immune system and mediate responses against viruses, parasites, bacteria, and tumor cells. Additionally, NK cells contribute to the adaptive immune response by linking innate and the adaptive immunity through their receptor FcγRIIIA (CD16). Two distinct subsets of human NK cells have been identified based on CD56 expression: CD56dim and CD56bright NK cells (PMID: 3086432). These NK cell subsets lack CD3 expression and are phenotypically and functionally distinct. We also include natural killer T (NKT) cells in this chapter as they also express the CD56 marker on their surface, however they do express CD3. Additional NK cell subsets can be identified according to their tissue distribution. These have a different repertoire and effector functions compared to peripheral blood NK cells. The majority of human peripheral blood NK cells are CD56dim (90%) and express high levels of CD16; a minority (10%) are CD56bright and CD16dim/neg. CD56bright NK cells are known for their capacity to produce and secrete cytokines, such as granulocyte–macrophage colony-stimulating factor (GM-CSF), IFN-γ, interleukin (IL)-10, IL-13, and TNF-β. Resting CD56bright and CD56dim NK cell subsets show differences in their NK cell receptor repertoires (PMID: 9469418). CD56bright NK cells express the high/intermediate affinity IL-2 receptor that confers the capacity to expand in vitro and in vivo in response to low doses of IL-2 (PMID: 7678599, 1692080). CD56bright NK cells do not express CD16 and express low levels of CD69, killer-cell immunoglobulin-like receptors (KIRs), and intracellular perforin (PMID: 15536127). Resting cells have low cytotoxicity, but after activation with IL-2 or IL-12, CD56bright cells exhibit similar or enhanced cytotoxicity against targets compared to CD56dim cells. CD56dim NK cells are considered terminally differentiated and mature NK cells that are enriched in bone marrow, blood, and spleen (PMID: 12480696, 15536127, 16606675). CD56dim NK cells are cytolytic and efficient effectors of natural and antibody-dependent target cell lysis. In contrast to CD56bright NK cells, resting CD56dim NK cells express only the intermediate-affinity IL-2 receptor and proliferate weakly in response to high doses of IL-2 in vitro (PMID: 1370410). An important feature of CD56dim NK cells is the expression of KIRs and CD16 but not CCR7 and L-selectin. CD56dim cells also express perforin and granzymes, and are more cytotoxic against NK cell-sensitive targets (K562 and COLO205 cell lines) than CD56bright NK cells (PMID: 2530273). Miltenyi Biotec has created dedicated application protocols to isolate and analyze NK cells. Dedicated solutions from Miltenyi Biotec allow the direct isolation of NK cells from whole blood, but they can also be isolated from PBMCs generated by density gradient centrifugation or using the MACSprep™ PBMC Isolation Kit, human. Other starting materials such as whole blood, buffy coat or cone, leukocyte reduction system chamber (LRSC), and leukapheresis products can also be used to isolate NK cells. For more detailed information, see the MACS Handbook chpater Human Blood. Miltenyi Biotec has developed numerous products for the straightforward magnetic separation of CD56+ cells. CD56+ cells can be isolated either straight from whole blood, buffy coat, or LRSC without density gradient centrifugation and erythrocyte lysis, or from PBMCs after density gradient centrifugation. For details on MACS® Cell Separation Technology, see the MACS handbook chapter Magnetic cell separation. *Automation options range from fully automated benchtop solutions such as the autoMACS® Pro Separator to high-throughput platforms such as the MultiMACS™ Cell24 Separator Plus or MultiMACS X. **Semi- or fully automated high-throughput cell separation with the MultiMACS™ Cell24 Separator Plus or MultiMACS X. The StraightFrom™ CD56 MicroBead Kits were developed for the rapid selection and isolation of CD56+ cells directly from whole blood, buffy coat, LRSC or Leukopak. The kits require no sample preparation and are optimized for a specific starting material. Subsequent depletion of CD3+ cells using CD3 Microbeads, human yields purified NK cells. Fast isolation of CD56+ cells from buffy coat. Separation was performend with the StraightFrom™ Buffy Coat CD56 MicroBead Kit and the MultiMACS™ Cell24 Separator Plus with the Single-Column Adapter and Whole Blood Columns. Cells were fluorescently stained with CD56-PE, CD3-APC, CD45-VioBlue® and analyzed by flow cytometry on the MACSQuant® Analyzer. Cells were triggered via CD45-VioBlue, cell debris and dead cells were excluded from the analysis based on scatter signals and propidium iodide fluorescence. The MACSxpress® NK Cell Isolation Kit isolates untouched NK cells directly from small volumes (2 mL) to larger volumes of whole blood (up to 30 mL). Non-target cells are removed by immunomagnetic depletion while erythrocytes are simultaneously sedimented to yield untouched target cells of high purity. Untouched NK cells from whole blood. The MACSxpress NK Cell Isolation Kit, a MACSmix™ Tube Rotator, and a MACSxpress Separator were used to separate NK cells from 30 mL of human EDTA anticoagulated whole blood. 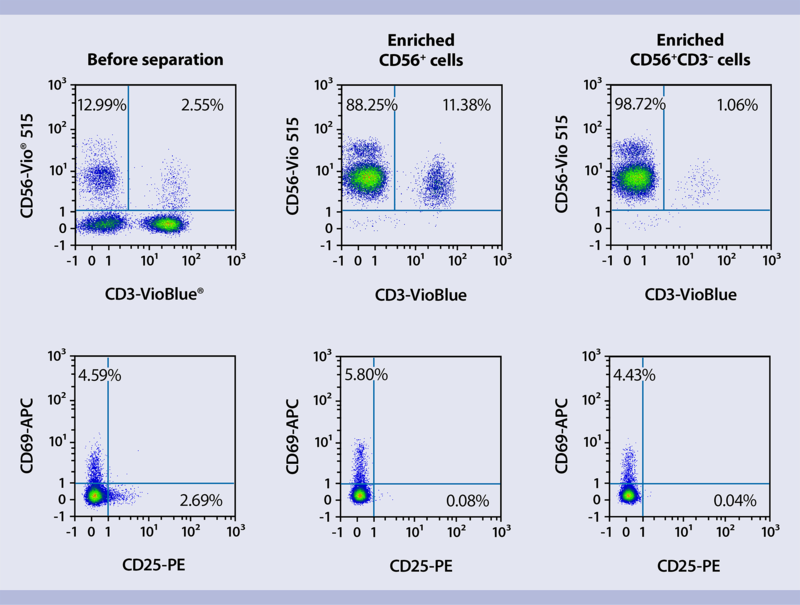 The isolated cells were fluorescently stained with CD45-VioBlue, CD3-FITC, and CD56-PE, and analyzed by flow cytometry using the MACSQuant Analyzer. Cell debris, non-leukocytes, and dead cells were excluded from the analysis based on CD45 expression, scatter signals, and propidium iodide fluorescence. Instead of working directly with whole blood or whole blood products, samples can be processed by density gradient centrifugation to pre-enrich peripheral blood mononuclear cells (PBMCs) that serve as starting material for subsequent NK and NKT cell isolation. CD56 MicroBeads, human enable positive selection or depletion of CD56+ cells by direct magnetic labeling. Alternatively, use of the REAlease® CD56 MicroBead Kit, human, followed by a depletion step with CD3 MicroBeads, human leads to pure and non-activated NK cells. Pure population of non-activated NK cells. In a first step, REAlease CD56 MicroBeads were used to enrich CD56+ cells. After removal of the REAlease MicroBeads, the CD3+ cell fraction was depleted from the CD56+ cell population with CD3 MicroBeads, human, to yield CD56+CD3– NK cells with a high purity of 98%. Monitoring CD69 and CD25 levels by flow cytometry after isolation confirmed no activation of the NK cells. Pure population of non-activated NK cells. In a first step, REAlease CD56 MicroBeads were used to enrich CD56+ cells. After removal of the REAlease MicroBeads, the CD3+ cell fraction was depleted from the CD56+ cell population with CD3 MicroBeads, human, to yield CD56+CD3– NK cells with a high purity of 98%. Monitoring CD69 and CD25 levels by flow cytometry after isolation confirmed no activation of the NK cells. The NK Cell Isolation Kit, human enables fast isolation of untouched NK cells from human PBMCs. Non-NK cells (i.e., T cells, monocytes, neutrophils, eosinophils, B cells, dendritic cells, granulocytes and erythroid cells) are labeled with a cocktail of biotin-conjugated antibodies. Subsequently, these non-target cells are magnetically labelled with the NK Cell MicroBead Cocktail and depleted to yield highly pure NK cells. Isolation of untouched human NK cells from PBMCs. Samples were processed with the NK Cell Isolation Kit, an LS Column, and a MidiMACS™ Separator. Cells were fluorescently stained with CD56-PE, CD3 FITC, as well as CD45-VioBlue, and then analyzed by flow cytometry on the MACSQuant Analyzer. Cells were triggered via CD45-VioBlue, cell debris and dead cells were excluded from the analysis based on scatter signals and propidium iodide fluorescence. Listed in the table are dedicated kits for different NK cell subsets, but it is possible to isolate virtually any subset using the new REAlease CD56 MicroBeads, human. The MicroBeads are designed to isolate CD56+ cells (NK and NKT cells) and then be easily removed for subsequent separation steps using other markers. NK cell subsets and their differentiation status can be determined by flow cytometry based on their expression of cell surface markers, transcription factors, and their secretion of cytokines. Miltenyi Biotec offers a vast portfolio of conventional and recombinant REAfinity™ antibodies for comprehensive analysis. 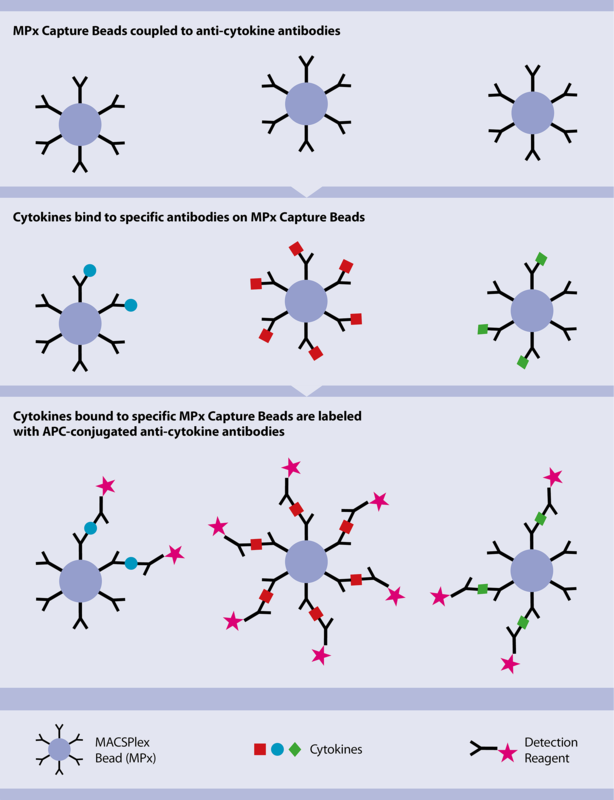 Miltenyi Biotec offers a range of solutions for the analysis of NK cell-associated cytokines. MACS Antibodies can be used for intracellular staining of cytokines. MACS Cytokine Secretion Assays allow detection and enrichment of viable cytokine-secreting cells. The kits are available for a wide range of cytokines, including TNF-α, GMCSF, IFN-α, IFN-γ, IL-2, IL-4, IL-5, IL-10, IL-12, IL-13, IL-17, and IL-22, and can be used for further characterization of NK cell subsets. The MACSPlex Cytokine Kits are used for multiplex analysis of secreted cytokines in serum and cell culture supernatants using a standard flow cytometer. Cytokines that can be analyzed in a single sample include: GM-CSF, IFN-α, IFN-γ, lL-2, IL-4, IL-5, IL-6, IL-9, IL-10, IL-12p70, IL-17A, and TNF-α. Principle of the Cytokine Secretion Assay – Cell Enrichment and Detection Kits. Principle of MACSPlex Assays. Samples containing unknown levels of analytes are incubated with the antibody-coated MACSPlex (MPx) Capture Beads, and analytes bind to the specific antibody. A Detection Reagent, composed of a cocktail of APC-conjugated antibodies specific for the analytes, is added. Consequently, sandwich complexes are formed between the MPx Capture Bead, the analyte and the Detection Reagent. These complexes can be analyzed based on the fluorescence characteristics of both the MPx Capture Bead and the Detection Reagent. Standards of known quantities of given analytes are provided with the kit and are used for the quantification of the analytes within the unknown samples. Samples containing unknown levels of analytes are incubated with the antibody-coated MACSPlex (MPx) Capture Beads, and analytes bind to the specific antibody. A Detection Reagent, composed of a cocktail of APC-conjugated antibodies specific for the analytes, is added. Consequently, sandwich complexes are formed between the MPx Capture Bead, the analyte and the Detection Reagent. These complexes can be analyzed based on the fluorescence characteristics of both the MPx Capture Bead and the Detection Reagent. Standards of known quantities of given analytes are provided with the kit and are used for the quantification of the analytes within the unknown samples. NK cells are cultured to assess their cytotoxic functions, to study how to enhance these functions, and to obtain higher numbers of cells for further downstream applications, just to name a few applications. NK MACS Medium, research grade is a cell culture medium developed specifically for NK cells. It has been used in a variety of applications and, in combination with MACS cytokines, is an ideal starting point for reliable cultivation conditions. Superior Expansion of NK cells in NK MACS Medium. NK cell fold expansion from (A) PBMCs (n=3) or (B) isolated NK cells (n=3) using 5% AB serum and 500 IU/mL of IL-2 was significantly higher in NK MACS Medium compared to standard culture methods. Superior Expansion of NK cells in NK MACS Medium. NK cell fold expansion from (A) PBMCs (n=3) or (B) isolated NK cells (n=3) using 5% AB serum and 500 IU/mL of IL-2 was significantly higher in NK MACS Medium compared to standard culture methods. Superior Expansion of NK cells in NK MACS Medium. 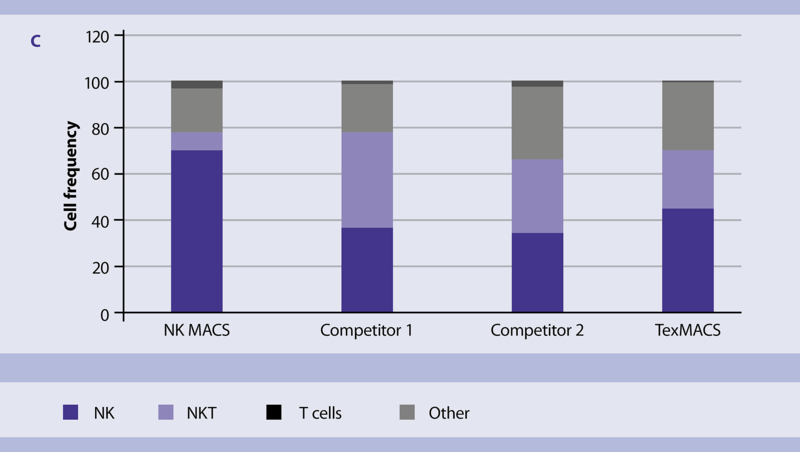 Cell composition after 14 days of PBMC expansion in NK MACS Medium shows a higher proportion of NK cells compared to different standard culture media. NK (CD3–CD56+), T cells (CD3+), NKT (CD3+CD56+) and other (CD3–CD56–). Cell composition after 14 days of PBMC expansion in NK MACS Medium shows a higher proportion of NK cells compared to different standard culture media. NK (CD3–CD56+), T cells (CD3+), NKT (CD3+CD56+) and other (CD3–CD56–). For detailed information about Miltenyi Biotec media optimized for NK cells, see chapter Cell culture media. NK cell activation is essential for a variety of downstream application. Miltenyi Biotec offers polyclonal stimulation reagents that have been carefully designed to ensure optimal stimulation conditions. The NK Cell Activation/Expansion Kit, human employs large cell-sized particles loaded with biotinylated antibodies against CD2 and CD335 (NKp46) to activate and expand primary cells. The large cell-sized particles mimic antigen-presenting cells and, when applied in a specific bead-to-cell ratio, lead to efficient NK cell activation. Greater NK cell expansion with the NK Cell Activation/Expansion Kit. 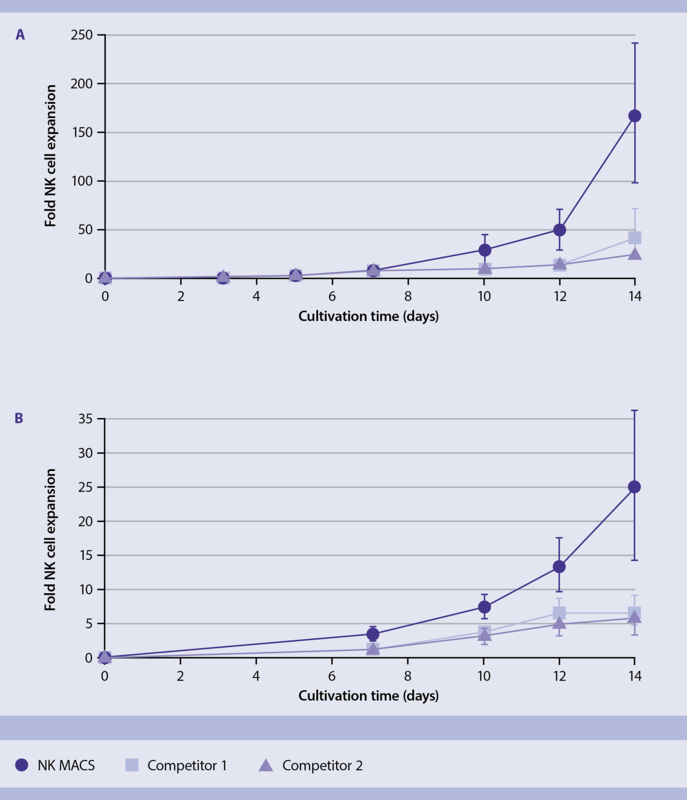 Starting with NK cells isolated with the NK Cell Isolation Kit, human (n=2), cells were stimulated at day 1 using the NK Cell Activation/Expansion Kit, or left unstimulated by culturing in medium with IL‑2 alone. Although CD56dim NK cells predominate in blood, CD56bright NK cells are far more abundant in the human body due to their enrichment in lymphoid and non-lymphoid tissues. Their presence, however, varies greatly in number, from only a small percentage of total lymphocytes in secondary lymphoid organs to up to 50% or more of all lymphocytes in some organs, such as the human uterus (PMID: 27121652). NK cells are also known to infiltrate tumor tissue to a varying degree, depending on the tumor. For more information about tumor-infiltrating lymphocytes, see Human – Tumor tissue and Cells in tumor tissue.